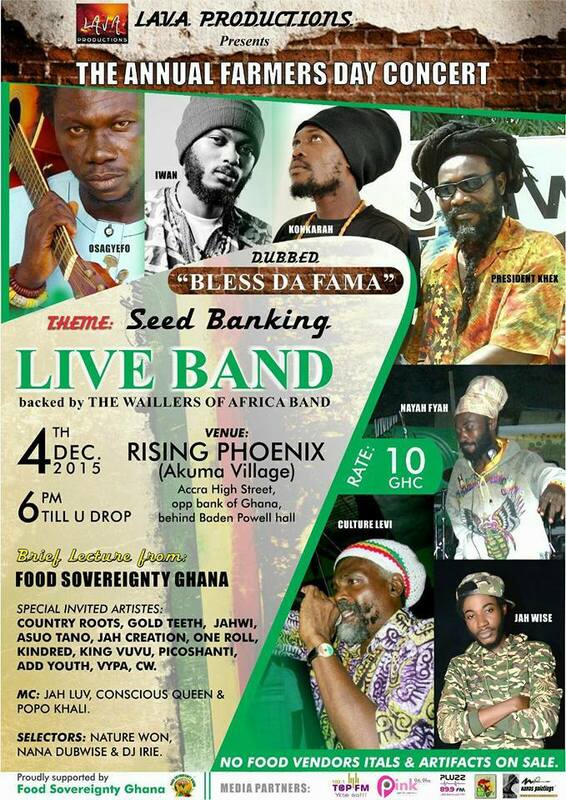 Food Sovereignty Ghana Salutes Ghana’s Farmers!! Food Sovereignty Ghana (FSG) has called on the the authorities to focus more on agroecology rather than biotechnology and patented GM foods with all the associated health, environmental, and socio-economic hazards. In a statement hailing Ghanaian farmers on Farmers’ Day, FSG, a grass-roots movement of Ghanaians, home and abroad, dedicated to the promotion of food sovereignty in Ghana, called on policy-makers to take urgent steps to ensure the safety and health of Ghanaian farmers in the light of the dangers posed by pesticides that are probably carcinogenic. FSG also reiterates its call for an indefinite moratorium on the use of GMOs in agriculture, as experts increasingly point to agroecology as the key to the challenges facing our agriculture today: climate change, growing populations to feed, etc..
Food Sovereignty Ghana (FSG) wishes to congratulate all farmers and agricultural workers on the occasion of the National Farmer’s Day. We wish to highlight and recognize the important role that farmers play in contributing to the growth of our national economy. Approximately sixty percent of the country’s labour force is gainfully employed in agriculture to sustain their livelihood. It is a fact that farmers provide twenty percent of the national gross domestic product (GDP) and thus remain a key stakeholder of any development agenda. FSG wishes to recognize the invaluable contribution to food security and economic development made by many farmers whom in the greatest of logistical challenges persevere to provide much needed local food security. This year’s National Farmer’s Day celebrations come at a time when Ghana is at a key crossroads regarding the adoption of an agricultural system based on the commercialization of genetically modified organisms (GMOs). Despite a growing trend across the developing world where countries are either completely banning GM crops or imposing strict mandatory labelling regimes in the interest of consumer rights and safety, Ghana is rather proceeding with the adoption of this controversial and novel technology with little transparency or the involvement of the key stakeholders, being farmers, consumers and civil society organizations. FSG is highly concerned about the speed at which local policy makers in the agricultural sector are proceeding to adopt GM agriculture with its heavy dependency on expensive imported chemicals, its reliance on large energy inputs and its negative impact on the ecological integrity of the environment. The latest United Nations Report on Sustainable Development cites a need to make a dynamic shift away from large commercial based agriculture to one of more agroecological friendly practices which are in the best interests of a sustainable and viable planet. FSG finds it vindicating that on Wednesday December 2, 2015 a special double page (40,41) centre-spread titled “ “Danger on Farms – Health Dilemma of pesticide use in modern agriculture” written by Gabriel Ahiabor was featured in Ghana’s widest circulated print medium, the Daily Graphic newspaper. It drew the attention of the public to the lack of proper education and regulation on the use of pesticides and herbicides among rural farmers. FSG further calls upon policy makers in the agricultural sector to draw on the negative experiences of farmers in India, Brazil, Argentina and other countries regarding the growth of GM crops to consider the long term implications of handing over ownership of our seed stock into the hands of profit-oriented corporate entities who will then be in a position to charge astronomical prices for seeds for which they will essentially become monopoly suppliers. It is indeed a key issue of great national security dimensions if such a significant percentage of the population’s livelihood would be determined by foreign owned corporations. We believe that Ghanaians are entitled to the basic right to know what is in the food we are eating, how that food is produced, its implications on our health, the environment, and socio-economic progress! In the interest of aligning with the foreign agricultural policies of countries such as the USA, the signing of this controversial protocol in Arusha Tanzania, which ironically took place on the 55th anniversary of our Republic on July 1st 2015 remains largely unknown to most Ghanaians. There is an obvious and calculated agenda by the government to keep its agenda in the dark without the involvement of the very populace that will consume such proposed GM foods. FSG is currently seeking to get as many Ghanaians aware of the controversial Arusha Plant Variety Protocol and the need to persuade the legislature against the ratification of such a bill which,like the infamous Plant Breeders’ Bill, would undermine our national interest. The signing of the protocol on behalf of the Ghanaian people was done by Ghanaian delegates from our Attorney Generals office & Ministry of Justice despite the huge national controversy surrounding a similar bill: the Plant Breeders’ Bill. FSG is not amused by the secrecy surrounding this protocol and call for accountability and transparency. We note with dismay that this is still unknown to the general populace as it was not reported in the local media. FSG is currently engaged in the processes of filing an appeal against a ruling by the Humans Right court on Thursday, 29th October, 2015, dismissing an application brought forward by FSG as lead plaintiff, for an interlocutory injunction on the commercialization and release of GM cowpeas and rice. Food Sovereignty Ghana (FSG) strongly disagrees. It is the contention of FSG that Modern Biotechnology is a potent and novel technology that presents unique risks. This means that whatever the perceived benefits seen in advances in biotechnology, they must be developed and used with adequate safety measures for the environment and human health. This is why the international conventions such as the Cartagena Protocol on Biosafety (CPB), and the Convention on Biological Diversity (CBD) regulating its safe use need to be respected, especially as most of these laws have been domesticated in Ghanaian law. We take this opportunity to reiterate our call for an indefinite moratorium on the use of GMOs in agriculture, as experts increasingly point to agroecology as the key to the challenges facing our agriculture today: climate change, growing populations to feed, etc.. There is a sharply divided opinion in the scientific community, even among molecular biologists, that genetically engineered crops are “safe”. 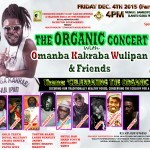 It is in light of all these precautions that FSG calls on all farmers, responsible parents, spiritual leaders, community elders and leaders of political parties to join the people of Ghana who once educated on the issues are overwhelmingly against the agenda to change the agricultural systems that have been used sustainably for millennia by our forebears. Despite the lack of transparency and engagement by regulators FSG is encouraged by the support of organizations like the Christian Council of Ghana, the Office of the National Chief Imam, The Ghana Muslim Mission, The Religious Bodies Network Against Climate Change (RELBONET), National Catholic Bishops Conference, The Convention People’s Party, the Vegetarian Association of Ghana, The Great Consolidated People’s Party, the Seventh Day Adventist Church among many others. And together, we stand firmly behind the farmers of Ghana!